IT competency certification constitutes a formal way of confirming individual's competences in specific areas of knowledge and skills related to applied computer science and information technologies. IT competency certificates are documents supporting or replacing other formal ways of confirming knowledge, skills and competences acquired within vocational education (including certificates or diplomas of universities and schools). 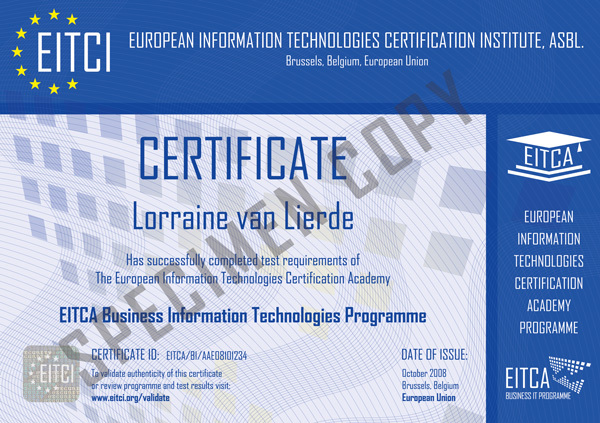 EITCA Academy programme, conducted under the accreditation of the European Information Technologies Certification Institute (EITCI) in Brussels, allows - after successful completion of the examination procedure - to obtain the EITCA international IT certificates issued in Brussels, along with the detailed supplements. Certification is possible both within the complete EITCA Academy programme in the chosen field (examinations within all courses included in the academy programme and complete EITCA certificate), as well as within more specialized single EITC courses (single exam and single EITC programme certificate within each respective EITC course). In terms of a substantive content the EITCA certification programme (equivalent of 135 hours of stationary classes, or 2 university semesters) corresponds to specialized postgraduate studies, yet with the advantage of an international nature of the certification standard (the certificates are issued in Brussels in English language). An important feature of EITCI Institute certification programmes is a possibility to complete only chosen single EITC certification programmes corresponding to the individual courses forming the respective academy (single specialized certified EITC courses with an average didactic content of 15 hours). The EITCA and EITC competence certification programmes include programme content designed from the ground up so that no prior IT knowledge is required to complete them, despite their advanced and specialized quality. This allows even the most specialized EITCA/EITC certification programmes to be successfully completed by individuals without IT preparation, while being also relevant for IT professionals and experts in the corresponding areas. 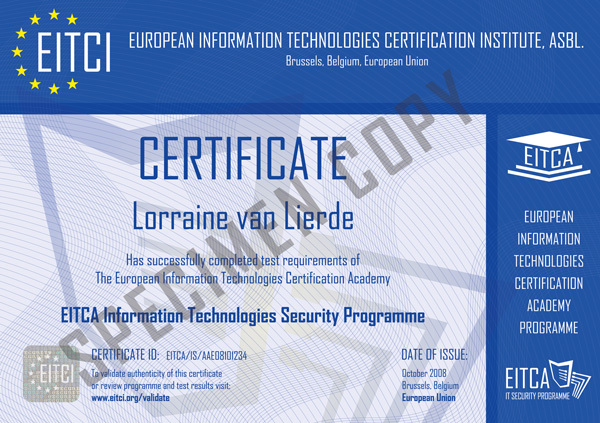 The EITCA programme certification procedure is not only the issuance of properly secured certificates in the paper form (including the detailed programme supplements), but also entering of the properly secured data to the EITCI institute certifications validation system (allowing online verification of the programme details of the programme scope completed by the certificate holder as well as printing of the adequate confirmations and supplements). So far the EITCI Institute have issued over 50 thousand certificates within the European Union (including the specialized areas of applied computer science, as well as programmes for public administration digitization (eGovernment) and prevention of digital exclusion). The examination and certification procedure aimed at formal confirmation of acquisition of knowledge and skills in specific areas of information technologies, is carried out by ITTC CompLearn according to the guidelines of the EITCI Institute, in a fully remote form via the special online examination system integrated within the e-learning platform. All EITCI certification costs are fully included in the EITCA/EITC programmes participation fees, as specified on the Fees page. The following academies are available within the English edition of the EITCA Academy programme, systematizing professional competence standards in specific areas of applied computer science, and allowing to obtain the respective EITCA certificates issued in Brussels by the EITCI institute. 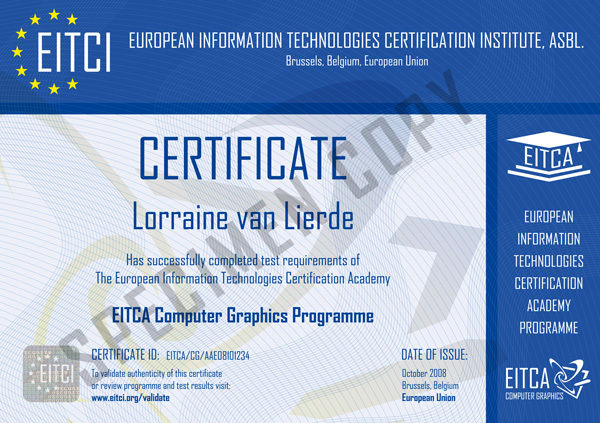 EITCA/CG Computer Graphics certificate is a formal, internationally recognized attestation of competence, systematizing a broad theoretical knowledge and especially practical skills in the field of computer graphics. Computer graphics is one of the most important and widespread applications of information technology in the modern economy and society, which are becoming increasingly computerized. It is currently the basis of modern marketing, product development, architecture, entertainment and even art. Created with the use of appropriate tools it becomes more and more an indispensable element of all visual communications (including e.g.. Internet websites, TV movies and shows, commercials, video games, multimedia presentations, books and newspapers, photographs, utility design, and many others). In the era of progressing digitization of life, skills in the field of computer graphics are increasingly important, and the role of skilled graphic designers on the modern labour market cannot be underestimated. Professional skills in the field of computer graphics can be utilized in countless applications - within gainful employment, business activities and personal life. A formal confirmation of these skills with an international certificate further enhances their value, especially in the eyes of potential employers. 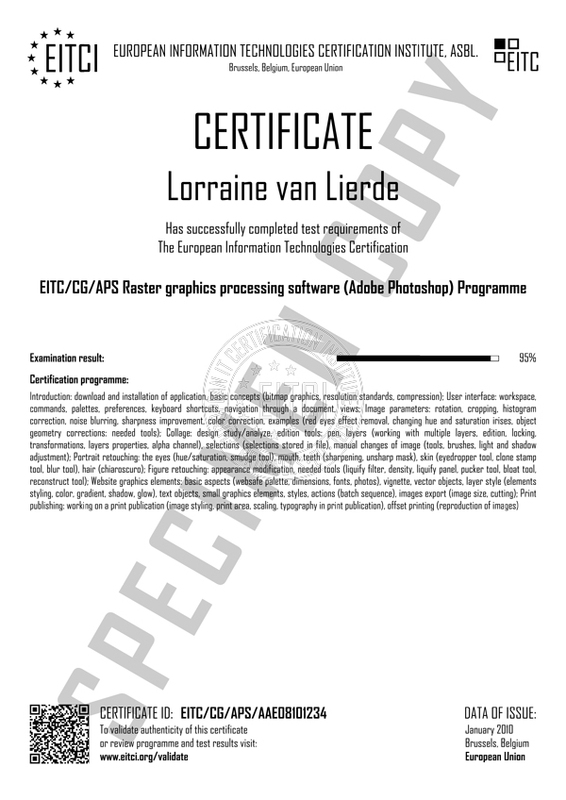 The EITCA/CG certificate provides an attestation of professional competencies in the area of producing visual creations within the raster (Adobe Photoshop), vector (Adobe Illustrator) and three-dimensional graphics, artistic and technical design (including visual web design with Adobe Dreamweaver and Flash technologies), creating animations and interactive graphics (Flash) and understanding the aspects of corporate identity and graphic design in the context of broadly understood art and technology. Obtaining the EITCA/CG Academy certificate is associated with acquiring knowledge and passing the final exams within all of the 9 single EITC courses constituting the academy (also available separately as single EITC certification programmes). More information can be found on the e-Learning and Programme pages. 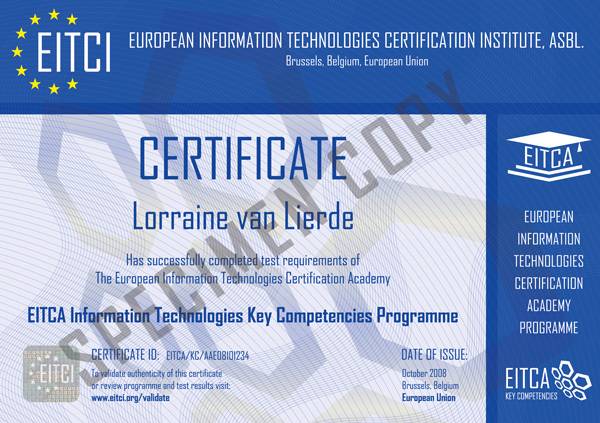 EITCA/KC Information Technologies Key Competences certificate is a formal, internationally recognized attestation of key competencies within information technologies, that are being widely used and required on the modern labour market and in the knowledge-based economy. The program is compatible with the European Union's Directive of the European Parliament and the Council from 18 December 2006 on key competences for lifelong learning (2006/962/EC), i.e. such IT competencies that are needed for self-realization and personal development and improvement, especially on the professional level of the information society and knowledge-based economy. The EITCA/CG certificate provides an attestation of acquired IT competencies identified as essential on the current labour market primarily by employers and HR staff in every sector of the modern economy. The certificate increases the desirability of its holder in almost every profession (especially clerical, administrative and business jobs) and proves the holder's desire of self-improvement in rapidly changing technological environment. Obtaining the EITCA/KC Academy certificate is associated with acquiring knowledge and passing the final exams within at least 5 of 12 single EITC courses constituting the academy, as chosen by the participant (also available separately as single EITC certification programmes). More information can be found on the EITCA/KC IT Key Competences Academy website. EITCA/IS Information Security Academy certificate is a formal, internationally recognized attestation of knowledge and practical professional skills in the broad area of security of information processed within electronic systems (including security threats, cryptographic methods, information security fundamentals theory, methods for information security management, formal and legal aspects of IT security, as well as more specific technical concepts and technology usage concerning security of computer networks and information systems security). The programme scope of the EITCA/IS Information Security Academy includes knowledge about methods for ensuring a proper functioning of information systems in terms of confidentiality, reliability and integrity of the processed data, which is currently one of the most sensitive areas of information technologies. The development of the information society and knowledge-based economy entails not only an omnipresent virtualization of economic and social processes, but also an increasing level of IT threats and vulnerabilities of information exposed to potential attacks and manipulation. Specialized knowledge and skills in the area of information security, formally confirmed with and international EITCA/IS Information Security certificate, constitutes an important component of professional competencies not only in professions associated directly with information security, but also in virtually any professions with responsibilities generally related to operation and usage of information systems and computer networks (including especially a strongly computerized financial sector or the sector of large companies and corporations, but also all institutions relying on the dependable information systems such as public administration). EITCA/IS programme is intended for employees of any economic sectors, whose work is connected with data processing within information systems, as well as to IT specialists and all other individuals interested in an extremely interesting and evolutionary problem of information security, who wish to acquire or expand their skills in this area. Obtaining the EITCA/IS Academy certificate is associated with acquiring knowledge and passing the final exams within all of the 12 single EITC courses constituting the academy (also available separately as single EITC certification programmes). More information can be found on the EITCA/IS Information Security Academy website. EITCA/IS Information Security Academy certificate is a formal, internationally recognized attestation of competencies in the broadly defined area of applications of information technologies in business (any economic activities), including electronic business (e-business) and administration. The programme scope of the EITCA/BI Business IT Academy includes knowledge about information technologies supporting business and administrative processes (including project management, modern internet marketing and advertising, applications of networking and information technologies in e-business, office software, ERP systems for managing business processes and resources, customer relationships management systems CRM, RTC systems for real-time communications and collaboration, CMS systems for Internet websites content management and administration, mobile systems, and many others). IT competencies in the area of information technologies applications for business (including e-business) and administration are - in the context of increasingly computerized economy - very important component of qualifications, desirable from any employee of both companies and corporations as well as non-commercial institutions (including public administration). The IT technologies in business and administration applications are intended to improve the processes of management and resource planning, and to automate numerous important operations (such as workflows, real time communication and collaboration etc.). The scope of application of modern information technologies covered by the EITCA/BI Business IT Academy programme corresponds with the current business needs of the modern economy, and is intended not only for individuals professionally dealing with information technologies, but even beforehand for those on any administrative, business and managing positions, which will increasingly and inevitably have to deal with information technologies. Obtaining the EITCA/BI Academy certificate is associated with acquiring knowledge and passing the final exams within all of the 12 single EITC courses constituting the academy (also available separately as single EITC certification programmes). More information can be found on the EITCA/BI Business IT website. Access to the mentioned EITCA certification programmes systematizing knowledge and skills in specific areas of modern and economy-essential applications of information technologies (as well as their constituent single-subject EITC certification programmes) is now available to all interested individuals (not only IT professionals). With fully remote form of the online examination and certification procedures carried out via properly secured systems with integrated Internet e-learning platforms, barriers associated with obtaining specialist IT certificates have been significantly reduced (no requirement for physical presence at the examination centre and long-term waiting for the examination date). Additionally, due too support of the European Union's funds under the European Regional Development Fund, a significant reduction of certification costs up to 80% is currently available within the full scopes of the programmes.